It has been a week since CFO submitted their response to my final attempt to rescue our chicken appeal. The Tribunal still has not responded to the arguments submitted by the opposing sides. What could that pregnant pause mean? The Tribunal could have had a response within the hour after the closing of the time for submitting responses. After all, how long does it take to type "Case dismissed!". However, that summary dismissal has not occurred. Obviously, the Tribunal needs a little bit more time than an hour to consider what has been submitted. The CFO's 5 page submission takes about an hour to read a few times. Not very deep, nor complex. It wouldn't take more than a day to agree or disagree with CFO's submission, and adopt what they submitted. At a week delay and counting, it likely isn't CFO's response that is delaying the issuing of the Tribunal's answer. The Tribunal allowed us a maximum of 10 pages to convince them that the Tribunal has sufficient jurisdiction and powers to hear this appeal. Our 10 pages of legal arguments are designed to try and keep the appeal alive. Those 10 pages are complex, filled with legal references and footnotes. It is comprehensive, and has maximum possible density so as to fit everything into those 10 pages, the maximum allowed . It is a significant task just to read those 10 pages. In addition, our Submission Brief of 1,085 pages contains the full text of all the Court transcripts referenced and relied upon in our 10 page submission, plus our signed Petitions in support of our appeal. That would take at least a week just to read. Could it be the Appellant's arguments that are slowing down the Tribunal's response? That doesn't necessarily mean that we are going to win this skirmish. I think there is a 90% chance that our appeal gets dismissed no matter how strong our legal arguments may be. However, our legal arguments are sufficiently strong and persuasive that it takes a significant effort to cast them aside and make it plausible. That is why it's taking the Tribunal so long. The Tribunal wants to appear to be fair and legally correct. Whatever the true reasons for the pregnant pause, it appears that the Tribunal is reading and considering our arguments. That's an important first step. There is a slim chance that the Tribunal will be sufficiently persuaded so as to overcome 50 years of #ChickenMafia dogma, precedence, well-embedded habits, and political favoritism. That won't be easy for the Tribunal to achieve, but it may be possible. Let us hope and pray together the Tribunal's Panel Members have the personal strength to do what is right. On the last available day, we finally have CFO’s reply to our appeal and the Tribunal’s threat to dismiss our appeal. I was always told to first find the good in all things before criticizing, so that is where I will start. CFO, to the best of my abilities to detect, has no spelling mistakes, and their sentence structure shows intelligence, education, and strong rhetorical arguments. It appears that CFO's lawyer did the best he could with the weak hand that he was given. He was unable to present any evidence or case law in support of CFO's position; perhaps because there aren't any available. "Mr. Black's Amended Notice of Appeal is restricted to challenging CFO Regulation No. 2425-2013 and the 300 bird chicken exemption policy;"
Not applicable to Northern Ontario, and other under-serviced or remote areas of Ontario. If the Revised Notice of Appeal is to be limited to the impugned Small Flock Regulation, why does CFO complain that "...the small flock regulation continues to serve as the toe-hold for the advancement of Mr. Black's broader concerns and agenda." In my Revised Notice of Appeal, I gave evidence on why my appeal of the Small Flock Regulation should be allowed. CFO takes exception to me being allowed to present evidence against the Small Flock Regulation. Apparently CFO feels I am only allowed to appeal if I don't present any evidence to support my case. That would certainly be an interesting appeal process. "In addition, the Tribunal gives Mr. Black the opportunity to persuade it that it has the jurisdiction to grant the relief set out in section 11 (p. 96-97) of the RNOA." In my arguments to support our appeal and prevent the dismissal without a hearing, I gave it my best shot to convince the Tribunal in 10 pages or less. I also said that if I was not fully successful in my arguments to convince the Tribunal, I offered to withdraw all contentious points, defaulting to exactly what the Tribunal has already agreed to (ie. the Small Flock regulation, and the 300 bird limit). Still, CFO is not satisfied. CFO spends 5 pages complaining that I improperly persist in my claims, even though the Tribunal gave me the opportunity to make final convincing arguments on those points. CFO does none of this. CFO presents mere rhetoric against the claims made, but makes no attempt to diminish the legal precedents I presented. Perhaps that's because the Supreme Court of Canada cases are the law of the land, and cannot be attacked in any reasonable way. Perhaps CFO has no case, and they know it. Perhaps CFO is like a scared gorilla, who throws dust in the air as a smoke screen so as to distract attention, blind the opponent, or cover their retreat without being seen. The best that CFO can come up with is gorilla dust. We will soon see how far the Tribunal is willing to stretch out their neck in favor of CFO's position. Although we were once advised to focus on foods low in saturated fat, and more recently those low in trans fats, the benefits of choosing foods with a favourable ratio of omega-3 to omega-6 fatty acids is increasingly clear. Therefore not only is it important to increase our intake of omega-3 fatty acids, but at the same time we need to control our intake of omega-6. Traditionally our diet had close to an equal ratio of these polyunsaturated fats, but according to an article published in Canadian Family Physician (2006) a typical North American diet now has a ratio close to 16:1 in favour of omega-6 fatty acids. This increased ratio may explain why cardiovascular disease and other chronic health problems are now much more prevalent. One way to lower this ratio is to carefully select the meats we eat, as the ratio of omega-6 to omega-3 fats can vary widely. As mentioned in the article in Canadian Family Physician, omega-3 fatty acids are cardio-protective in several ways, helping to reduce inflammation, arterial narrowing and blood clot formation, while controlling the rhythm of our heartbeat. Meanwhile, Healthy Canada explains that omega-6 fatty acids are associated with inflammation, a risk factor for heart disease and stroke, as well as various other chronic health problems. Omega-3 fatty acids exert their benefits beyond the health of our blood vessels though. For instance, KwikMed advises that omega-3 fatty acids are needed for healthy brain development both in the uterus and during a child’s early years of life. These essential fatty acids also seem to protect our mental health, as Ascenta Health informs us that low intakes of omega-3 are associated with an increased risk of depression. Besides protecting our cardiovascular and brain health, Auum Omega 3 describes how the anti-inflammatory effects of omega-3s may also reduce our risk of diabetes, cancer and multiple sclerosis, which are less common among populations with a more favourable intake of omega-3. Oily fish are one of the best dietary sources of omega-3 available, with wild salmon providing more than 10 times as much omega-3 as omega-6 fats. However, choosing meats with a healthier ratio of these two fatty acids is another helpful way to regulate our intake of these fats. As shown in the table below, the ratio of commonly consumed meats varies between close to 2:1 and 27:1. Caribou offers the most favourable ratio of omega-3 and 6 thanks to the fact that the meat is naturally organic, grazing on grasses and other plants, which themselves are rich in omega-3 fatty acids. This is also why grass-fed beef also offers a more beneficial ratio of fats when compared to other domestic meats and particularly to grain fed beef. Of the other domesticated meats, chicken offers the best ratio of polyunsaturated fats, coming ahead of turkey and even beating wild duck. Offering the least favourable ratio by far is pork, so even if you choose lean pork, which is low in saturated fat, it has far more omega-6 by ratio than any of the other meats considered. While a nutrient analysis report by the Chicken Farmers of Canada (2014) showed there was no significant difference between the amounts of omega-3 and omega-6 contained in organic and non-organic chicken, this is contrary to previous findings. For example, a research paper shared on Academia.edu (2012) highlighted that a systematic review by scientists at Stanford University found that organic chicken contains significantly more omega-3 than its grain fed counterparts. As with grass-fed beef, this is due to the higher omega-3 content of plants growing in the pasture, especially leguminous varieties such as vetch and clover. Indeed an article published in the Journal of Agricultural and Food Chemistry (2005) showed that the fatty acid content of poultry is strongly influenced by the omega-3 and omega-6 content of their diet. Based on this, nutritional data for commercially reared birds should show a less favourable omega-3 to 6 ratio. However, companies such as Tyson and MapleLodge do not provide complete nutritional information for their chicken, merely showing that it is low in saturated and trans fats, without giving a breakdown of their polyunsaturated fat content. For consumers still focused on saturated and trans fats, this is reassurance enough, but with increasing awareness of the benefits of meat with an optimal ratio of omega-3 and omega-6, this is not sufficient to convince those of us who know that organic poultry is a healthier choice. 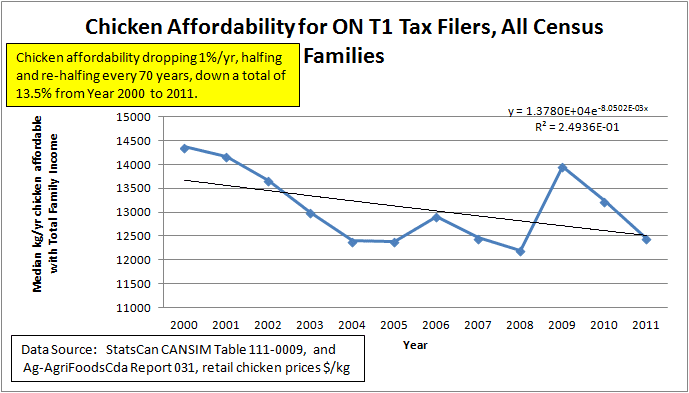 What has happened to chicken affordability for the average person in Ontario? Previously, I looked at chicken affordability for those living in poverty see LICO-Chicken = "Let Them Eat Cake"), and for those living on Minimum Wage (see Unaffordable Chicken in Ontario). Now, lets look at what is happened for the average person in Ontario. The above graph was constructed using data from Statistics Canada on the household income of all persons who filed an Ontario T1 income tax, and the retail price of chicken in Ontario from Agriculture and Agri-Foods Canada. As can be seen in the graph, the affordability of chicken has dropped by 13.5% over this 11 year period. Somebody has an agenda for raising the price of chicken irregardless of its affordability. CFO has been given the regulatory powers to control everything about chicken, including the distribution and pricing. Is CFO aware of these issues? Are they taking action to stem or reverse these trends? Or are they helping to create this trend for themselves and their friends, in spite of their duty to serve the greater good of the Ontario public? It is done. The Tribunal's has accused our chicken appeal as frivolous, vexatious, and done in bad faith. The answer to those allegations was made late last night, so it's delivery is effective as of today 2014/08/14, one day before the Tribunal's deadline. Now the other parties have 10 days to respond with their view of the world. That window closes on Sunday Aug. 24th, so they will have till Monday Aug. 25th at 4:00 PM to submit their response. After that, the Tribunal will decide, and issue its written decision in 30 days or less. Both the Federal and Provincial governments have a right to input their position to the Tribunal. Will they sit on the sidelines in full neutrality, choosing to let David and Goliath battle to the death? Or, will these powerful past allies of Chicken Farmers of Ontario ("CFO") again pick up the proxy sword and do as CFO's lobbyists instruct the government to do, come to the aid of CFO, the Frankenstein creation and favorite son of the governments? A son only its Mother could love. Sometimes strange, unexpected things happen. Perhaps this is one of those cases. I was asked a question by someone who has been in a ringside seat for these Chicken Wars. Was I a lawyer in my former life? I replied "No". I explained that I have a "dangerous" ability to learn quickly, and to finish what I started. One of the mistakes I made was in ever going down this road in the first place. What was I thinking! My family, friends, & neighbours regularly shake their heads in disbelief at what I have been going through for the last 3 years to bring these issues to the forefront, seeking government's attention and change for the better. However, I think it unreasonable to expect this level of dedication that has been demanded of me so as to improve this critical food system for Canadians. No wonder the average citizen never considers attempting what I have attempted. Clearly this system, and all other governmental systems need to be much more responsive to the needs of the people. Perhaps we need to solve the government's problem with accountability & responsiveness before we can use that more responsive government to solve the citizen's growing list of other issues. Perhaps I erred by trying to fix the wrong problem. The response to the Tribunal's Notice of Intent to Dismiss Appeal is now ready for submission to the Tribunal (I think...I hope). The deadline is Friday at 4:00 PM, so we still have 3 days left to ruminate or improve before the deadline. Remember: Our goal is freedom for Small Flockers, and affordable chicken for Canadians. Sometimes it's hard to remember that after going through all these legal acrobatics. I haven't got much more to add, and I'm totally out of space to add anything more, so unless somebody has a really good idea, this is probably the final submission. It has to be filed by this Friday, Aug. 15th, 2014 before 4:00 PM. I get Knocked Down, but I get up Again. You're never gonna keep me down. The new theme song for Small Flockers, and our ongoing battle with Chicken Farmers of Ontario ("CFO"). My appeal is frivolous, vexatious, or made in bad faith. They have no powers or jurisdiction to hear any of my complaints. The Tribunal said they would give me one last chance, an opportunity to submit up to 10 pages to convince them that none of these allegations are true. To make all of this "legal", they sent me a Notice Of Intention To Refuse To Hear Appeal. Now, I have 15 days to respond before they pull the trigger and my appeal is summarily executed. I have drafted a Small Flocker response, Rev. 5. I am not totally happy with what it says right now, so further improvements are needed. I have used up every available square millimeter of space, so if something is missing, something else will have to be deleted. I hope you will give it a read, and offer some of your life experience as suggestions to improve. The deadline for filing an answer is 4:00 PM on Friday Aug. 15, 2014. Your suggestions need to be submitted by the 14th so I have time to review them, and get them entered into the draft. Even though the blindfold is in place, our hands are tied behind our back, and we are up against a bullet riddled wall, it doesn't necessarily mean it's time to panic. Rev. Hugh MacDonald (a friend of mine and former Pastor) told me that back in the 1980's, he was involved in a protest against indiscriminant pesticide spraying to control the spruce budworm in Nova Scotia. An informal group of citizens tried complaining to the government, but the government wouldn't listen, so they took the government to court. The legal challenge was lead (or assisted) by Elizabeth May, law student and daughter of one of the citizen leaders. That group of citizens lost in Court, but that loss, and the publicity gained, helped them win in the court of public opinion. Without the loss of the court battle, and its focusing of public attention, they might never have won the war against indiscriminate pesticide spraying. Perhaps that battle helped focus the life of Elizabeth May, who is now the Party Leader of the Green Party of Canada, and a Member of Parliament. I wonder if Small Flockers are destined to take the same (or a similar) path through history?